Need a helping hand when it comes to cleaning and maintaining your hard floors? All you need is one of these best floor mops. 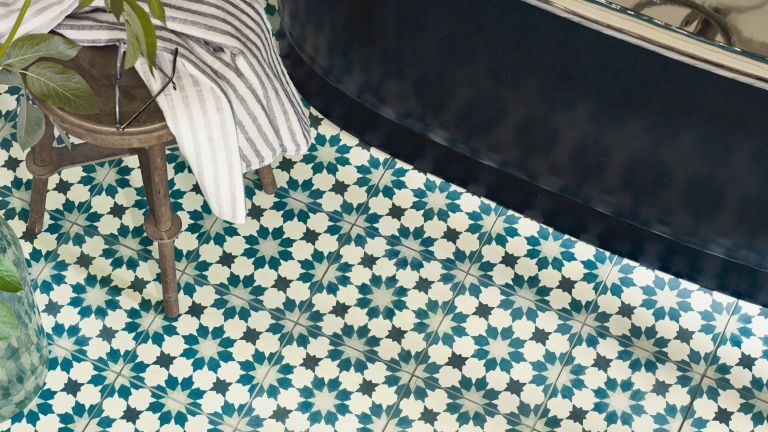 Happily, the days of scrubbing floors are long gone thanks to the latest mops designs – they'll make giving your floors a shiny finish a breeze. Wondering which to choose from the myriad choices? We’ve created a list of the best mops, from dust mops to spray mops. Your floors will be gleaming in no time. Find out more about cleaning and maintaining your hard floors in our guide. For more cleaning buys, hacks and advice head to our hub page, or take a look at the Real Homes pick of the 50 best cleaning products for your home. When you’re looking for the best floor mop for your floors, firstly check the material of the mop head. The most popular choice is microfibre, as it's soft, hygienic and fast drying. Some mop heads are slightly abrasive and are made from stainless steel, plastic and microfibre. While these are excellent at removing stains and embedded dirt, they shouldn’t be used on limestone or marble as they’re too abrasive. Sponge is also a good choice as it's breathable and absorbent, and works great on flat untextured flooring. Does it require a bucket? If you're after a quick and easy-to-use mop, it's best to steer clear of ones that require a bucket. Instead, opt for a spray mop for a faster finish; these mops-without-buckets also cut down on the amount of storage space you need to keep them – all you need to do is fill up the bottle with hot water and your chosen floor cleaner, attach it to the mop and you're away. Most mop heads are washing machine friendly too, giving them longevity (and, for you, cleaner floors, but do check first). Important if you're less able or elderly, some mops can be weighty when loaded, so weigh that up (sorry) when you're buying. Note: spray mops might be heavier than classic mops, but you won't have the weight of the bucket to lug around. Some mops come with a free bucket, some extra heads or other accessories you may reach for when cleaning your home. If they don't, then be sure to check how much replacement heads cost before you buy. Inexpensive and convenient, this mop and bucket combo is perfect for getting any mopping job done. The bucket comes with a spout which makes it easier to empty, and the foot pedal aims to make it super easy to dry the mop out so you don't end up soaking your floors, and once you’re finished, mess is minimised. Not only is it simple and reliable, but the triangular shaped, microfibre head is designed to make it easier to reach corners and pick up 20 per cent more dirt than a standard cotton mop head. The head is also easily machine washable or you can purchase an additional mop head whenever you require it. The price tag on this mop may be low, but the quality is very high. It's durable, makes an easy job of cleaning and it has a handle that acts as a trigger to release cleaning solution so you can target tough stains for maximum impact. Its 350ml water cartridge also means you use fresh water with every sweep. The turquoise mop features an aluminium handle which is moulded for comfort and it's easy to manoeuvre under and around furniture. Overall, it's a great mop that uses a thin microfibre pad to contain dirt and not just push it around your floor. We think it's the best floor mop for everyday spray cleaning. Mopping up spillages doesn’t have to be so tricky/messy with this easy-to-handle sponge mop. This highly absorbent mop is ideal for tiled floors and features 3D flocked material in order to maximise particle pickup and remove any stubborn dirt. The sponge can easily be wrung out and the heads are interchangeable as and when you need to replace them. It's efficient, Mrs Hinch loves it and it's great value for money. The size of this mop also makes it ideal for smaller homes as it is easy to store away. With an easy-wring handle and a super absorbent (and replaceable) 10 inch sponge on the end, this Casabella mop is an oldie but a goodie. Made from steel so it's both durable and rust resistant, this is one of the best floor mops if you regularly deep clean. Lots of mops tend to just move the dirt around your floor, however thanks to this one's sponge head, it won't just pick up the dirt, but if you use the heavy-duty lever, it'll wring out the sponge so it's as dry (and as clean) as possible after each use, meaning your floors will dry in no time. All you need is a bucket and you're sorted. Designed to provide a cold steam clean for your floors with its spray head, this mop can be used with plain water or a cleaning solution, or dry as a floor duster. The microfibre pad aims to pick up dirt dust and hair in one easy motion, and the pad is reusable time and time again. The best part is that it doesn’t require a bucket; however you need to control the sprays to ensure the floor does not get too wet, as this can leave the floor smeary. If you don’t get on with traditional mops, this is a great space and time saver for the home. Looking for an eco-friendly mop? Your search is over. This E-cloth Deep Clean Mop requires no chemicals to leave your floors sparkling, just water to wet the microfibre mop head. The mop itself is made from durable, lightweight aluminium and it has an adjustable handle spanning 1.5m for those hard to reach places. Said to remove over 99 per cent of bacteria from your floors, it's also recommended by Allergy UK. Those who have pets should opt for the duster mop head, which removes dust, fluff and hair from hard floors with ease. Eco-friendly cleaning at its finest. Mops don't always require a bucket of soapy water. If you’ve got pets that leave their hair everywhere, then this dust mop is a great way to quickly and easily pick up all those hairs. This mop is for dry use only, but is especially good if you have a large surface area that often needs cleaning. It's easy to use and clean, and the detachable comb allows you to get to those hard-to-reach areas that end up getting very dusty. What more could you want? This floor mop is specifically designed to clean your hardwood, laminate or other wooden flooring with care. The pad emits a solution that is pH neutral, non-streaky and non-dulling, to ensure your floors stay looking as good as new even after a deep clean. Not only is it easy to use thanks to its trigger which sprays the solution on the area that needs cleaning, but if you have tile floors, this mop can also be purchased with the special tile and ceramic solution cartridges, the only downside is these can add up when you need to replace them later down the line. Great value for money, and worth it because it makes such a mundane chore completely stress-free. Best budget floor mop: looking for the best floor mop on a budget? Designed to trap dirt and leave hard floors clean, the Minky Smart Squeeze Mop features an absorbent sponge mop head which has a powerful wringing system to ensure you don't soak your floors. Moisten before use and push the sliding handle towards the mop head to wring it out, glide it over your floors and wait for it to dry. Rinse the sponge with water after use then leave to dry ready for your next clean. Complete with an easy to fit refill head, the mop features the Royal Warrant of Appointment, so if it's good enough for the royals, it's good enough for us. This basic dry mop works with disposable cloths which act as a magnet to pick up lingering dust, dirt and debris with ease. It’s ideal for quick tidy ups in between cleans, and for better results you could purchase a microfibre cloth rather than the standard ones. These can also be used damp for a more effective clean on some more stubborn bits of dirt. In our opinion, this is the very best floor mop you can buy for quick clean ups. The whisper-quiet, cordless AirCraft Powerglide will quickly and easily clean, polish and buff all your hard floors to a streak-free, professional-grade finish, with hardly any effort on your part and with no need for soggy mops and easy-to-knock-over buckets. Effective on sealed wood, vinyl and tiled floors, simply fill the Powerglide’s tank with your favourite cleaning liquid or water and off you go. There’s no cord to hold you back, so you can glide over all your hard floors with ease – it almost feels like it’s floating as you go from room to room. The ergonomic, height-adjustable handle means you can also get right under furniture, and the LED light lets you see under beds, sofas and sideboards. The machine washable cleaning pads are super-absorbent, so they’ll leave your floors spotless, virtually dry and streak-free. And, when you’re ready to polish, just pop on the washable waxing pads to buff to a shine. Designed with dual functionality, this handy mop is just what you need to clean various floors surfaces, including those areas that are often considered hard-to-reach. Its large, microfibre pad makes everyday mopping easier than ever, while the Slide-Out-Scrubber is perfect for tackling tough stains. Simply fill the bottle attached to your spray mop with your floor cleaner of choice, squeeze the handle and mop away, for clean floors with minimal effort required. Looking for more floor cleaning products and reviews?